1. Sherwood Forest Faire - Mar. 20th-22nd, 10am-dusk at 1883 Old Hwy 20 in McDade. Enjoy tons of fun activities at this Renaissance Festival based on the tales of Robin Hood and his Merry Men... right in your very own backyard! This weekend, Buy One Get One FREE at the gate all weekend!!! 2. Girls Night Out - Mar. 20th in downtown Bastrop. Participating shops will be open until 8pm and will host an in-store drawing for a gift certificate or other prizes. FREE! 3. Thunder on the Colorado - Mar. 20th-21st at Riverbend Park in Smithville. Biker Parade on Main Street in downtown Smithville on Mar. 20th at 7pm. Live music all weekend and more! $20/wristband; 21 and up. 4. "Agnes of God" - Mar. 20th & 21st at 7:30pm and Mar. 22nd at 2:00pm at Playhouse Smithville, located at 110 Main Street in Smithville. Tickets are $12/person and can be purchased in advance online or at the door. 5. Go Fish! Learn to Fish Event - Mar. 14th, 9am-12pm at Buescher State Park. Children and adults can learn the basics of fishing through fun, hands-on activities. Take away a fishing fun pack and enter the drawing for door prizes. Equipment and bait provided or bring your own. No license necessary. Free after park entry fee. 6. Summit Smithville Green Expo - Mar. 21st, 10am-3:30pm in downtown Smithville. Speakers, demonstrations, exhibits, bike safety workshop, farm-to-table feast, and more! FREE! 7. Smithville Trades Day - Mar. 21st, 10am-3pm in downtown Smithville. Vendors, food, sales, shopping, and more! FREE! 8. Sounds of the Night - Mar. 21st, 8-9pm at Bastrop State Park. Explore the sometimes spooky sounds of the forest at night. Learn about different nocturnal wildlife and their special adaptations. Free after park entry fees. 9. Yoga on the Patio - Mar. 22nd, 8:30-9:30am at Neighbor's Kitchen and Yard. Suggested donation of $10-20. 10. Hallelujah Hayride - Mar. 22nd, 2:00-5:30pm at Elgin Christmas Tree Farm. Due to weather conditions, the hayride will now be a walking tour. FREE! *But that's not all! 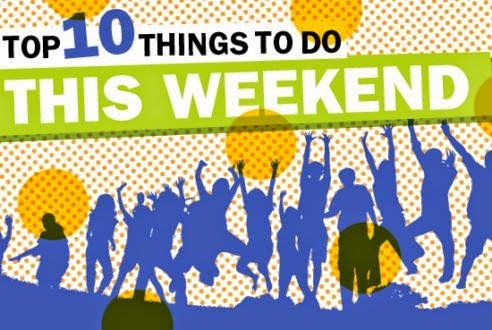 There's even more fun to be had this weekend in Bastrop County! For even more events, visit our interactive online calendar here.